GRAVENHURST, ON – Sawdust City Brewing has announced that sales of this year’s edition of 11.05 – its annual collaboration with Nickel Brook Brewing – raised $1200 in support of diabetes research. During the month of November, Sawdust City allocated $1 from each can of 11.05 sold in its retail store and pint served in its taproom to be donated to Crafting a Cure in support of JDRF Canada, a charitable organization that funds research into type 1 diabetes. 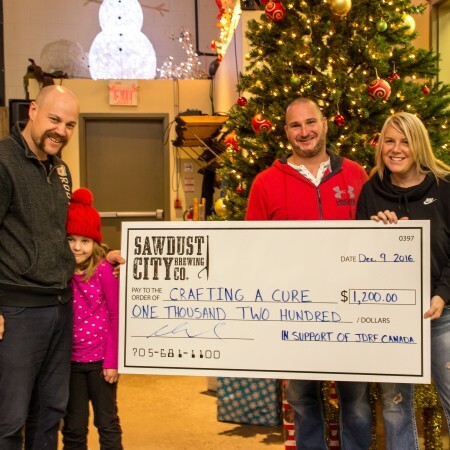 Sawdust City brewmaster Sam Corbeil, whose daughter has type 1 diabetes, met with Crafting a Cure founders Jeff and Cherie Lalonde this weekend to present them with a cheque for the donation.